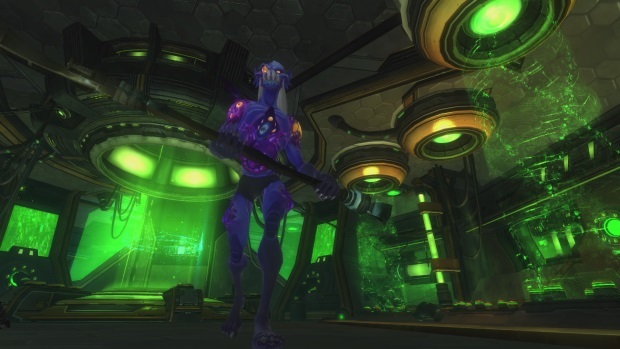 Carbine Studios has been rolling out additional details about WildStar’s first “Ultra Drop” – The Strain, continuing today with the announcement of the housing and customization updates that will be coming to the game. In The Strain, players will get the chance to turn their house into a horrifyingly elegant pad by adding items like bathtubs with claws, giant infected optical nerves, postulant purple barbs and more assorted grossness. In addition, a couple new housing plugs will be available including a Strainmaw mat for your unwelcomed guests and a Phage Form Lab. All of these additions give players a crazy amount of options to truly customize their house and the chance to earn more rest XP when logging out. Carbine is continually proving that WildStar provides the most robust housing customization tools in the genre. If your character isn’t ghoulish enough, upgrade your wardrobe with some rot couture by collecting each piece of a new ravenous Strain costume. New Strain dyes are also available as well as the sickest hoverboard ever, literally. Joymax is holding a special GM hunt in Knight Age. Heroes of myth and legend have new life breathed into them with Returners, especially in this Second Grand update.